Exactly one year ago, my life completely changed. Within moments at a surprise assembly, I went from being a third-grade teacher to being the voice for teachers across the state. I was suddenly the Michigan Teacher of the Year. I realized very quickly that this would be no easy task, but I was equally open to and terrified of taking on the challenge. To earn the honor, I had to dig deep into my beliefs and values as an educator, and construct a vision for the future of the profession. But now I actually had to put those philosophies into practice. While that day was incredible and overwhelming and emotional, it couldn’t even begin to prepare me for the wonder and awe I would experience through this once-in-a-lifetime adventure. The first thing I did was to try and understand the purpose of this role and why I would ever be worthy of it. My good friend and predecessor, Gary Abud, was a guiding light for me. He didn’t even know me when this began, but still spent countless hours sharing his experience, offering advice and helping me see the value I could bring to others. It is hard for teachers to see themselves as valuable, but I know now how powerful it can be when they do. So, what did I do this year? I found my purpose. It took me a while, but I broke through the stifling culture of our humble profession and learned to be confident about my strengths and comfortable with sharing them. I started blogging, tweeting, speaking at events, presenting at conferences and engaging in policy. I didn’t realize how rare it is for people to hear the teachers' perspective, and I know now that you don’t need a title to speak your truths. So, what did I do this year? I found my voice. I realized a longtime dream of becoming an author. A book I wrote nine years ago as a way to shatter bully stereotypes was now a catalyst for the work I’ve wanted to do on bully prevention. I used to read the story to my class on printer paper in a duo-tang folder, just to be able to share the message that even the smallest, sweetest and smartest kids act like bullies sometimes. Through this role, I got to spread my message and do author visits and workshops for kids, teachers and parents. I always hoped to shift the conversation around bullying, and I know now that it is something I will do long after this role ends. So, what did I do this year? I found my passion. I visited schools. I talked to students. I listened to teachers. I met incredible educators from all around the world. I connected with others and grew a network of the most genuine, passionate, dedicated, creative and inspiring people that I’ve ever known. I gained knowledge and strength and motivation with each encounter, and I know now that we are all in this together. So, what did I do this year? I found my team. I noticed a lack of teacher perspective in the places it is needed most. Determined to change that, I expressed the importance of teacher leadership to anyone who would listen. I rallied for more opportunities for those that are anxious to break through the walls of their classrooms and extend their reach. I shared ways to elevate this great profession and helped educators think like teacherpreneurs. I was always grateful to those that saw my potential and lit the fire within me, and I know now that I can do that for others. So, what did I do this year? I ignited the flame. I held a seat at the table during State Board of Education meetings. I testified before the House Education Committee. I engaged in dialogue with representatives of the U.S. Department of Education and the Foreign Domestic Policy Council. I worked with amazing teacher supporters like the CCSSO, MEA and NEA, Meemic, America Achieves, Scholastic, SMART Technologies, Smithsonian, Microsoft, University of Phoenix and Voya. I started conversations about what needs to change. I offered solutions that will help to change them. I always felt like teachers should have a say in decisions, but I know more than ever it is our responsibility to make our voices heard. So, what did I do this year? I made an impact. Oh yeah, I also happened to meet the President of the United States! This year was much more than an opportunity to have a title. It was a chance to push myself, try new things, and take risks to re-shape my beliefs about education and the role I want to play in it. It was a chance to see the teaching profession for what it truly can be – a gateway for change. The only thing I know for sure is that my work has just begun. But for now, it is time to pass the torch. Rick Joseph, an extraordinary fifth- and sixth-grade teacher from Birmingham Covington School, is our new Michigan Teacher of the Year! He is an award-winning educator and genuinely kind man whom I’m thrilled to know and excited to work with. He, too, will enjoy a once-in-a-lifetime adventure. He, too, will discover his purpose and find his voice. He, too, will make an impact and influence change. It is Rick’s turn to be our voice, and it is my turn to be the guiding light so that he can shine. Congratulations, Rick! Melody Arabo has been a third grade teacher at Keith Elementary in the Walled Lake Consolidated School District since 2002. She has a Bachelor's Degree in Elementary Education and a Master's Degree in Teaching and Curriculum, both from Michigan State University. She has been married for more than 12 years and has three children - an 8-year-old daughter and 4-year-old twin boys. In 2008, she was named Keith Elementary Teacher of the Year and was first runner-up for Walled Lake's District Teacher of the Year in 2009. 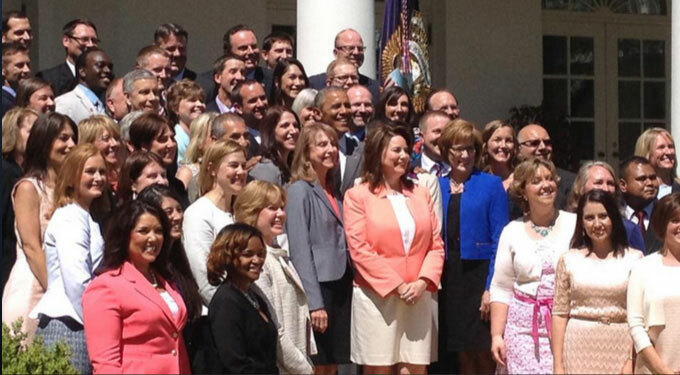 She was named Michigan Teacher of the Year on May 15, 2014, by the state.